Malnutrition occurs when there is an imbalance in an individual's dietary intake as a result of under-nutrition or over-nutrition. Disregarding the type, malnutrition is a serious health hazard, as it affects the proper functioning of the cells, tissues and organs, thus compromising bodily functions and the ability of the body to protect itself from external factors (Saxon et al, 2014). Therefore, it's imperative to pay attention to the malnutrition symptoms in order to make an early diagnosis. Lackluster and graying hair. The hair on malnourished people tends to be very dry and constantly falling off. Malnutrition symptoms showing on the face and skin usually encompass seborrhea, dermatitis, excessive dryness and rashes. Dryness in eyes that leads to corneal and conjunctival xerosis. Bitot's spots —a buildup of keratin found superficially on the conjunctiva— are also among the malnutrition symptoms in eyes. The mouth is affected by the following malnutrition symptoms: dryness in lips that leads to painful inflammation on the corners of the mouth, teeth decay, halitosis, excessive salivation and retention of fluids in the tongue. The latter can also be affected by pain, itching, loss of taste and cracking. Finally, the gums suffer often profuse bleeding and may become very inflamed and red. Other general malnutrition symptoms are spoon-shaped nails that are brittle and ridged —and a loss in muscle mass. Protein-energy malnutrition (PEM)—also called protein-calorie malnutrition— happens, as its name suggests, when there is an imbalance in protein or calorie intake.This is most common in children in the developing world, with cases of PEM in the industrialized world being attributed to illness in adults and fad diets in children. There are two types of protein-energy malnutrition: Kwashiorkor —imbalance in the protein intake— and Marasmus, which is a deficiency in all nutrients due to insufficient food intake. 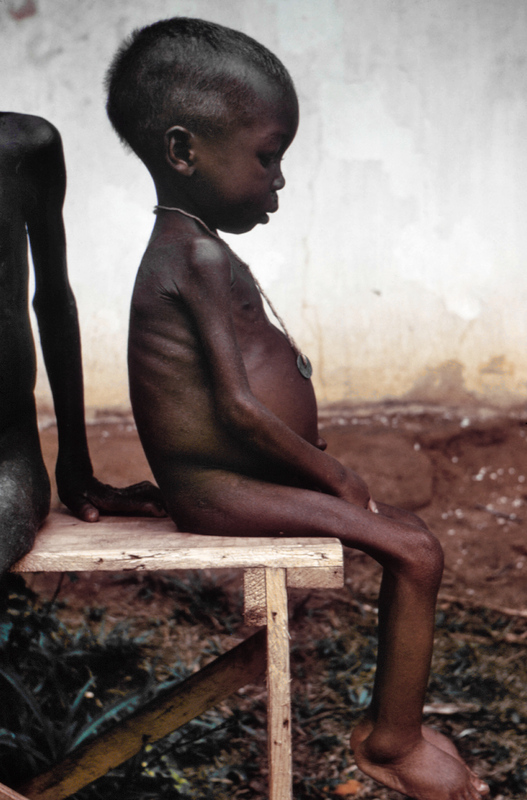 In severe cases, symptoms of both Marasmus and Kwashiorkor lead to a Marasmic-Kwashiorkor diagnosis. Loss of color in skin and hair. Full and round face, often called "moon face". People suffering from Kwashiorkor have unusually thin limbs with swollen hands and feet. As Dash and Dash (2008) put it, they are "skin, bones and water". Distended stomach caused by a retention of gas. This entails visible bloating in the abdominal region, also called a "pot-belly". As seen above, both types of protein-energy malnutrition entail symptoms specific to them and different from general malnutrition symptoms —they are also more severe. People suffering from any type of PEM are undergoing acute or chronic —or acute and chronic— malnutrition. 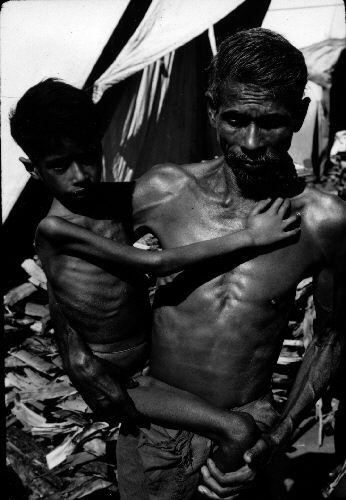 In poor people living in developing countries, this is a consequence of eating too little or not eating at all, due to the absence of food security. In fact, "Studies suggest that Marasmus represents an adaptive response to starvation, whereas Kwashiorkor represents a maladaptive response to starvation" (Scheinfeld, 2015).